First manned lunar landing. The end of the moon race and public support for large space programs. 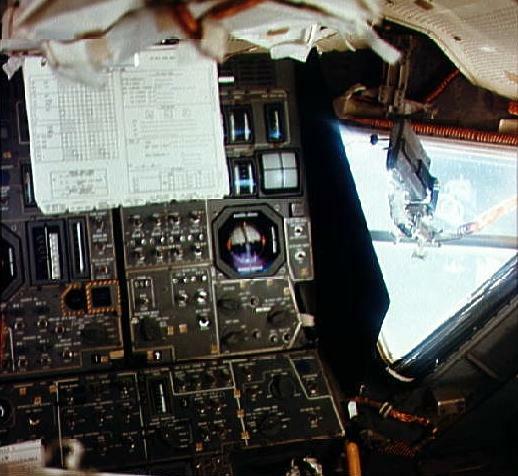 The many changes made after the Apollo 204 fire paid off; all went according to plan, virtually no problems. AKA: Columbia/Eagle. Launched: 1969-07-16. Returned: 1969-07-24. Number crew: 3 . Duration: 8.14 days. Location: National Air and Space Museum (Smithsonian Institution), Washington, DC. 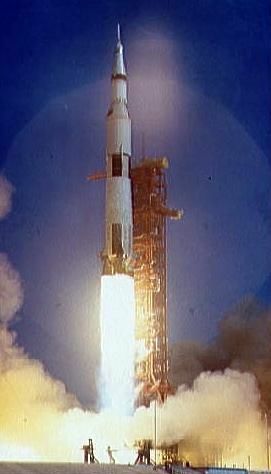 Apollo 11 (AS-506) - with astronauts Neil A. Armstrong, Michael Collins, and Edwin E. Aldrin, Jr., aboard - was launched from Pad A, Launch Complex 39, KSC, at 9:32 a.m. EDT July 16. The activities during earth-orbit checkout, translunar injection, CSM transposition and docking, spacecraft ejection, and translunar coast were similar to those of Apollo 10 . At 4:40 p.m. EDT July 18, the crew began a 96-minute color television transmission of the CSM and LM interiors, CSM exterior, the earth, probe and drogue removal, spacecraft tunnel hatch opening, food preparation, and LM housekeeping. One scheduled and two unscheduled television broadcasts had been made previously by the Apollo 11 crew. The spacecraft entered lunar orbit at 1:28 p.m. EDT on July 19. During the second lunar orbit a live color telecast of the lunar surface was made. A second service-propulsion-system burn placed the spacecraft in a circularized orbit, after which astronaut Aldrin entered the LM for two hours of housekeeping including a voice and telemetry test and an oxygen-purge-system check. 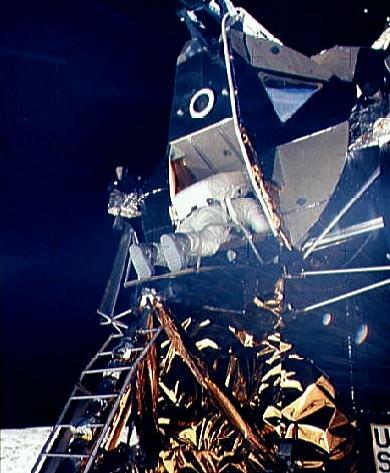 At 8:50 a.m. July 20, Armstrong and Aldrin reentered the LM and checked out all systems. They performed a maneuver at 1:11 p.m. to separate the LM from the CSM and began the descent to the moon. The LM touched down on the moon at 4:18 p.m. EDT July 20. 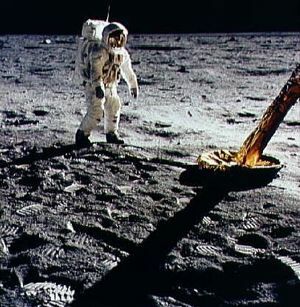 Armstrong reported to mission control at MSC, "Houston, Tranquility Base here - the Eagle has landed." 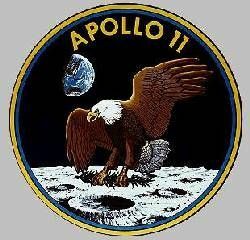 ( Eagle was the name given to the Apollo 11 LM; the CSM was named Columbia .) Man's first step on the moon was taken by Armstrong at 10:56 p.m. EDT. As he stepped onto the surface of the moon, Armstrong described the feat as "one small step for a man - one giant leap for mankind." Aldrin joined Armstrong on the surface of the moon at 11:15 p.m. July 20. 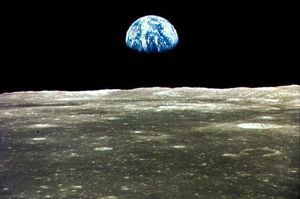 The astronauts unveiled a plaque mounted on a strut of the LM and read to a worldwide TV audience, "Here men from the planet earth first set foot on the moon July 1969, A.D. We came in peace for all mankind." 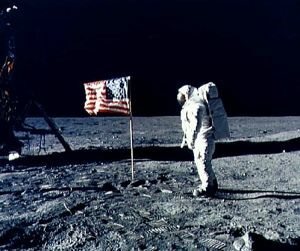 After raising the American flag and talking to President Nixon by radiotelephone, the two astronauts deployed the lunar surface experiments assigned to the mission and gathered 22 kilograms of samples of lunar soil and rocks. They then reentered the LM and closed the hatch at 1:11 a.m. July 21. All lunar extravehicular activities were televised in black-and-white. Meanwhile, Collins continued orbiting moon alone in CSM Columbia . The Eagle lifted off from the moon at 1:54 p.m. EDT July 21, having spent 21 hours 36 minutes on the lunar surface. It docked with the CSM at 5:35 p.m. and the crew, with the lunar samples and film, transferred to the CSM. The LM ascent stage was jettisoned into lunar orbit. The crew then rested and prepared for the return trip to the earth. The CSM was injected into a trajectory toward the earth at 12:55 a.m. EDT July 22. Following a midcourse correction at 4:01 p.m., an 18-minute color television transmission was made, in which the astronauts demonstrated the weightlessness of food and water and showed shots of the earth and the moon. At 12:15 p.m. EDT July 24 the Apollo 11's command module Columbia splashed down in the mid-Pacific, about 24 kilometers from the recovery ship U.S.S. Hornet . Following decontamination procedures at the point of splashdown, the astronauts were carried by helicopter to the Hornet where they entered a mobile quarantine facility to begin a period of observation under strict quarantine conditions. The CM was recovered and removed to the quarantine facility. Sample containers and film were flown to Houston. All primary mission objectives and all detailed test objectives of Apollo 11 were met, and all crew members remained in good health. "We'll get to the details of what's around here, but it looks like a collection of just about every variety of shape, angularity, granularity, about every variety of rock you could find. . . . There doesn't appear to be too much of a general color at all. However, it looks as though some of the rocks and boulders, of which there are quite a few in the near area, it looks as though they're going to have some interesting colors to them. . . . "
"The area out the left-hand window is a relatively level plain cratered with a fairly large number of craters of the 5- to 50-foot variety, and some ridges - small, 20, 30 feet high, I would guess, and literally thousands of little 1- and 2-foot craters around the area. We see some angular blocks out several hundred feet in front of us that are probably 2 feet in size and have angular edges. There is a hill in view, just about on the ground track ahead of us. Difficult to estimate, but might be half a mile or a mile. " ". . . The local surface is very comparable to that we observed from orbit at this sun angle, about 10 degrees sun angle, or that nature. It's pretty much without color. It's . . . a very white, chalky gray, as you look into the zero-phase line [directly toward the sun]; and it's considerably darker gray, more like . . . ashen gray as you look out 90 degrees to the sun. Some of the surface rocks in close here that have been fractured or disturbed by the rocket engine plume are coated with this light gray on the outside; but where they've been broken, they display a dark, very dark gray interior; and it looks like it could be country basalt. " Setting up the spacecraft systems took another hour and a half to complete; then they were ready to get out and explore. The flight plan called for them to eat and then rest for four hours, but Aldrin called Mission Control to recommend starting their surface exploration in about three hours' time. Houston concurred. Although they had been awake almost 11 hours and had gone through some stressful moments during the landing, it seemed too much to expect the first men on the moon to take a nap before they made history. While Armstrong and Aldrin tended to their postlanding chores, Mike Collins, orbiting 60 nautical miles (112 kilometers) overhead in the command module Columbia, had little to do. Houston enlisted his aid in an attempt to locate Eagle, giving him the best map coordinates they could derive from the sketchy information available. 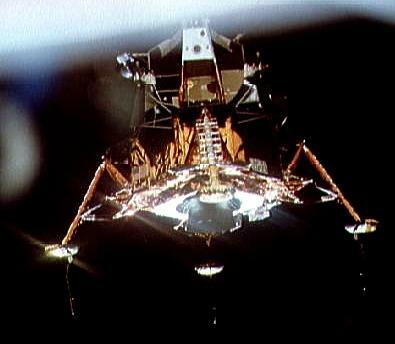 With his navigational sextant Collins scanned several spots, without success; Columbia passed over the landing site too rapidly to allow him to search the area thoroughly and he never found the lunar module. Determination of its exact location had to wait for postmission analysis of Armstrong's descriptions of the area and examination of the spacecraft's landing trajectory. Getting ready to leave the lunar module took longer than the crew had anticipated. It was after 9:30 p.m. in Houston, an hour and a half later than they had hoped, when they opened the hatch. Armstrong carefully worked his way out onto the "porch," then climbed down the ladder, pausing on the lowest rung to comment on the texture of the surface and the depth to which the footpads had penetrated. 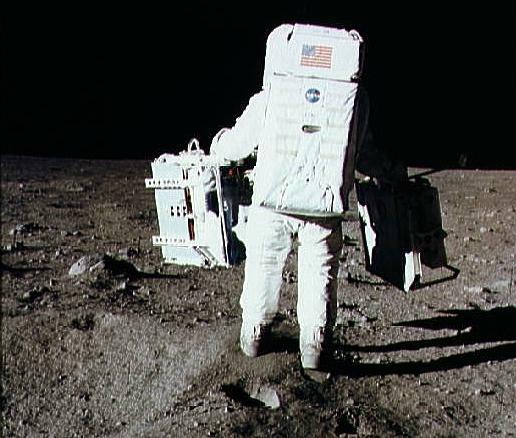 At 9:56 p.m. he stepped onto the moon's surface, proclaiming, "That's one small step for man, one giant leap for mankind" - inadvertently omitting an "a" before "man" and slightly changing the meaning he intended to convey. Armstrong made a cursory inspection of the lunar module and reported his reactions to the new environment. 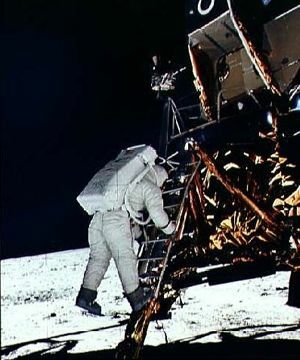 Aldrin then lowered a camera on the lunar equipment carrier - a clothesline and pulley arrangement that seemed out of place in the high-technology environment of Apollo - which Armstrong immediately began using. Mission Control reminded him to scoop up the contingency sample, which he did. "I'll try to get a rock in here. Just a couple." He noted that the collecting tool met resistance after penetrating a short distance into the surface material. He then stowed the sample in a bag that he tucked into a pocket of his suit. To the scientists on earth he remarked, "Be advised that a lot of the rock samples out here, the hard rock samples, have what appear to be vesicles in the surface. Also, I am looking at one now that appears to have some sort of phenocryst." Aldrin then joined Armstrong on the surface, and they spent the next several minutes inspecting the landing craft and reporting on its condition, adjusting to the low lunar gravity and trying various ways of getting around on the surface. After a brief commemorative ceremony (reading the plaque attached to the lunar module) and a short conversation with President Richard Nixon, they began unloading and emplacing the scientific instruments and collecting samples. They supplemented earth's limited television view of their activities with descriptions of what they were seeing and doing. On a couple of occasions they acted like field geologists. Aldrin reported that he saw a rock that sparkled "like some kind of biotite," but he "would leave that to further analysis." After closely examining some rounded boulders near the spacecraft, Armstrong said they looked "like basalt, and they have probably two percent white minerals in them. . . . And the thing that I reported as vesicular before, I don't believe that any more. . . . they look like little impact craters where BB shot has hit the surface." The geologists in Houston watching this surface activity on television were quite pleased with the astronauts' performance. 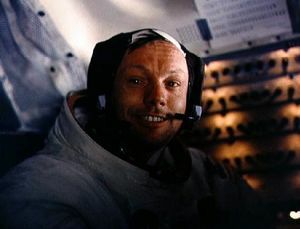 At one point Armstrong disappeared from the field of view of the TV camera, causing some momentary anxiety at his apparent departure from the plan. It turned out that some unusual rocks had attracted his attention and he had gone off a few meters to collect them. That was exactly the kind of thing the geologists had hoped people on the moon would do. By the time the crew had taken two core samples, again experiencing difficulty in driving a sampling tool into the surface, and filled their sample return containers, Houston notified them that it was time to wind up their activity. Just before midnight CapCom Bruce McCandless told Aldrin to "head on up the ladder," and at 12:11 a.m. Houston time both men and their samples were back in the lunar module and the hatch was sealed. Humanity's first excursion on the surface of another celestial body had lasted 2 hours, 31 minutes, and 40 seconds. Back inside the lunar module, Armstrong and Aldrin removed their lunar surface suits and portable life-support systems and used up their remaining film. Houston passed up some more instructions in preparation for liftoff and tentatively signed off for the night, but before long CapCom Owen Garriott, who had relieved McCandless, came on the line with some questions from the scientists about the nature of the surface and the problems in driving sampling tools into the surface. Three hours after they returned to the lunar module, the lunar explorers finally were able to turn in for a few hours of fitful sleep. Next morning Armstrong, Aldrin, and Collins spent most of their time setting up Eagle and Columbia for liftoff and rendezvous. Before the lunar module left the moon, however, Armstrong gave Mission Control a detailed description of the landing approach path and landing area, in the hope of helping scientists locate their exact landing spot, and summarized the characteristics of the soil and rocks around the area. Liftoff and rendezvous went smoothly. When the two spacecraft were locked together Collins cracked Columbia's oxygen supply valve and Aldrin opened the lunar module's vent valve, to create a gas flow into the LM when the hatches were opened - part of the procedure to minimize back-contamination-while Aldrin and Armstrong vacuumed the lunar dust from their suits as best they could. Their vacuum cleaner, a brush attached to the exhaust hose of the LM suit system, was not very powerful and the tenacious dust came off only with difficulty. There was not nearly as much loose dust in the lunar module as they had expected when they returned from the surface; evidently it stuck tightly to whatever it touched. They passed the rock boxes and other items over to Collins and then clambered into the command module, where they removed their suits and stowed them in the bags provided. After jettisoning the lunar module and straightening up the command module, the three astronauts settled in for an uneventful trip back to earth. In the early morning hours of July 24, 8 days, 3 hours, 18 minutes, and 18 seconds after leaving Kennedy Space Center, Columbia plopped down into the Pacific Ocean about 200 nautical miles (370 kilometers) south of Johnston Island. Recovery crews from the U.S.S. Hornet arrived quickly and tossed the biological isolation garments into the spacecraft. After the cocooned astronauts emerged from the spacecraft the swimmers swabbed the hatch down with Betadine (an organic iodine solution); then astronauts and recovery personnel decontaminated each other's protective garments with sodium hypochlorite solution. The biological isolation garments were not uncomfortable in the recovery raft, but aboard the helicopter they began accumulating heat. Both Collins and Armstrong felt that they were approaching the limit of their tolerance by the time they reached the ship. An hour after splashdown they were inside the mobile quarantine facility. As soon as they had changed into clean flight suits, the astronauts went to the large window at the rear end of the mobile quarantine facility to accept the nation's congratulations from President Nixon, who had flown out to the Hornet to meet them. Meanwhile, recovery crews brought Columbia on board and connected it to the astronauts' temporary home by means of a plastic tunnel. Through this, the film magazines and sample return containers were taken into the quarantine trailer, then passed out through a decontamination lock. Sample return container no. 2, holding the documented sample, was packed in a shipping container along with film magazines and tape recorders and flown to Johnston Island, where it was immediately loaded aboard a C-141 aircraft and dispatched to Ellington Air Force Base near MSC. Six and a half hours later the other sample return container was flown to Hickam Air Force Base, Hawaii, and thence to Houston. Family: Manned spaceflight. People: Aldrin, Armstrong, Collins. Country: USA. Spacecraft: Apollo CSM. Projects: Apollo, Lunar L3. Launch Sites: Cape Canaveral. Agency: NASA Houston. Bibliography: 4929, 5051, 7762. 1967 October 20 - . Grumman organizational changes to meet delivery date for Apollo LM-3 - . Nation: USA. Program: Apollo. Flight: Apollo 11. Spacecraft: Apollo LM. In an effort to meet a mid-April 1968 delivery date for LM-3, Grumman made a number of organizational changes. Top level direction was strengthened by adding experienced managers in strategic positions and by reinforcing the Grumman LM organization with more management talent and additional test personnel. A spacecraft director for each vehicle was brought into the program for LM-2, -3, -4, and -5, with responsibility for overall Grumman support of individual vehicles from cradle to grave. 1967 November 2 - . 1967 December 17 - . Apollo LM-5 window shattered during initial pressurization test - . Nation: USA. Program: Apollo. Flight: Apollo 11. Spacecraft: Apollo LM, LM Ascent Propulsion, LM Structural. A LM test failed in the Grumman ascent stage manufacturing plant December 17. A window in LM-5 shattered during its initial cabin pressurization test, designed to pressurize the cabin to 3.9 newtons per square centimeter (5.65 pounds per square inch). Both inner and outer windows and the plexiglass cover of the right-hand window shattered when the pressure reached 3.5 newtons per sq cm (5.1 psi). An MSC LM engineer and Corning Glass Co. engineers were investigating the damage and cause of failure. 1968 March 18 - . 1968 June 7 - . Apollo LM descent stage heatshield and thermal blanket problems - . Nation: USA. Related Persons: Faget. Program: Apollo. Flight: Apollo 11. Spacecraft: Apollo LM, LM Descent Propulsion. 1968 August 28 - . 1968 December 14 - . 1969 January 24 - . Apollo experiments on visual perception on the moon - . Nation: USA. Program: Apollo. Flight: Apollo 11. In an exchange of letters, the feasibility and compatibility of experiments covering contrast perception, color perception, and distance estimation on the moon were discussed. Incorporation of the three experiments in the lunar landing mission's detailed test objective "Lunar Environment Visibility" for Apollo 11 was recommended. 1969 March 7 - . Radiation survey of Apollo CSM 107 planned - . Nation: USA. Program: Apollo. Flight: Apollo 11. Spacecraft: Apollo CSM, CSM Block II. 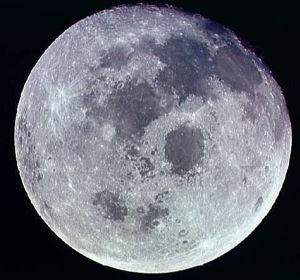 A radiation survey of CSM 107 was planned to determine if the radiation produced by onboard sources would be of a sufficient level to impair the effectiveness of proposed experiments to measure the natural radiation emitted from the lunar surface. The survey would be conducted at KSC by personnel from the Goddard Space Flight Center. 1969 April 25-26 - . 1969 April 29 - . Recommendation to carry an erectable antenna on the Apollo 11 mission - . Nation: USA. Program: Apollo. Flight: Apollo 11. The NASA Associate Administrator for Manned Space Flight concurred in a recommendation to carry an erectable antenna on the Apollo 11 mission. However, it would be deployed only if required to obtain satisfactory television, voice, telemetry, and biomedical data simultaneously from the lunar surface. Apollo Back Contamination Documentation and Configuration Control Office established - . Nation: USA. Program: Apollo. Flight: Apollo 11. The Apollo Back Contamination Documentation and Configuration Control Office was established at MSC to provide a documentation program for any possible contamination from the moon. 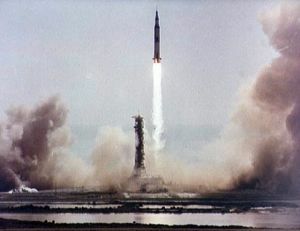 The program was required by June 15, to meet deadlines for the launch of Apollo 11. 1969 June 9 - . Apollo 11 on schedule - . Nation: USA. Program: Apollo. Flight: Apollo 11. Preparation of Apollo 11 was on schedule for a July 16 launch date. Lunar landmark and landing site mosaics were delivered for flight crew training. A flight readiness test, begun on June 4, had been completed June 6 despite an MSC Mission Control Center power outage that delayed the test for several hours. Modifications made to Apollo LLTV - . Nation: USA. Program: Apollo. Flight: Apollo 11. Spacecraft Bus: Apollo LM. Spacecraft: Apollo LLRV. 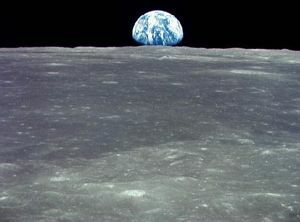 1969 June 23 - . 1969 June 27 - . Quarantine applicable to Apollo crew, spacecraft, and returned lunar soil - . Nation: USA. Program: Apollo. Flight: Apollo 11. The Interagency Committee on Back Contamination agreed to the designation of the MSC Director of Medical Research and Operations as the agent to impose a quarantine applicable to the crew, the spacecraft, and the returned lunar materials during any phase of the Apollo 11 mission. He was authorized to appoint persons at each location and phase of the mission who would have the responsibility of exercising the quarantine authority if necessary. 1969 July 16 - . 13:32 GMT - . Launch Site: Cape Canaveral. Launch Complex: Cape Canaveral LC39A. Launch Platform: LUT1. 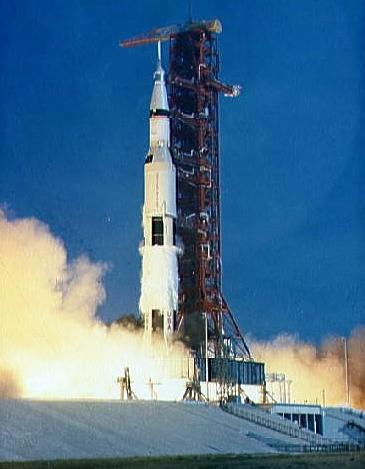 Launch Vehicle: Saturn V.
Apollo 11 - . Call Sign: Columbia. Crew: Aldrin, Armstrong, Collins. Backup Crew: Anders, Haise, Lovell. Payload: Apollo CSM 107 / Apollo LM 5 / EASEP / S-IVB-506. Mass: 28,800 kg (63,400 lb). Nation: USA. Agency: NASA Houston. Program: Apollo. Class: Moon. Type: Manned lunar spacecraft. Flight: Apollo 11. Spacecraft: Apollo CSM. Duration: 8.14 days. Decay Date: 1969-07-24 . USAF Sat Cat: 4039 . COSPAR: 1969-059A. Apogee: 186 km (115 mi). Perigee: 183 km (113 mi). Inclination: 32.50 deg. Period: 88.19 min. First landing on moon. Apollo 11 (AS-506) - with astronauts Neil A. Armstrong, Michael Collins, and Edwin E. Aldrin, Jr., aboard - was launched from Pad A, Launch Complex 39, KSC, at 9:32 a.m. EDT July 16. The activities during earth-orbit checkout, translunar injection, CSM transposition and docking, spacecraft ejection, and translunar coast were similar to those of Apollo 10 . At 8:50 a.m. July 20, Armstrong and Aldrin reentered the LM and checked out all systems. They performed a maneuver at 1:11 p.m. to separate the LM from the CSM and began the descent to the moon. The LM touched down on the moon at 4:18 p.m. EDT July 20. 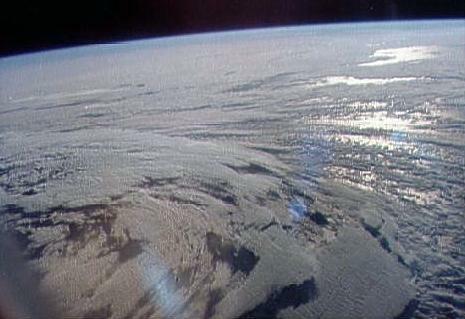 Armstrong reported to mission control at MSC, "Houston, Tranquillity Base here - the Eagle has landed." ( Eagle was the name given to the Apollo 11 LM; the CSM was named Columbia .) Man's first step on the moon was taken by Armstrong at 10:56 p.m. EDT. As he stepped onto the surface of the moon, Armstrong described the feat as "one small step for man - one giant leap for mankind." Apollo 11 LM - . Call Sign: Eagle. Payload: Apollo LM 5. Mass: 15,095 kg (33,278 lb). Nation: USA. Agency: NASA Houston. Program: Apollo. Class: Moon. Type: Manned lunar spacecraft. Flight: Apollo 11. Spacecraft: Apollo LM. Duration: 8.14 days. Decay Date: 1969-07-24 . USAF Sat Cat: 4039 . COSPAR: 1969-059x. Apogee: 186 km (115 mi). Perigee: 183 km (113 mi). Inclination: 32.50 deg. Period: 88.19 min. 1969 July 19 - . Apollo 11 crew observes illumination event in crater Aristarchus. - . Nation: USA. Program: Apollo. Flight: Apollo 11. During the Apollo 11 mission, members of the Lunar International Observer Network (LION) made continuous observations of a lunar area where illuminations had been noted. At 18:45 GMT (2:45 p.m. EDT), the astronauts sighted an illumination in the Aristarchus region, the first time that a lunar transient event was sighted by an observer in space. The sighting was confirmed by a LION observer in West Germany. 1969 July 20 - . 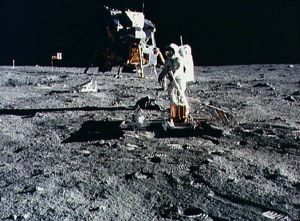 Apollo 11 achieves first landing of humans on the moon - . Nation: USA. Flight: Apollo 11. 1969 July 21 - . EVA Apollo 11-2 - . Crew: Aldrin, Armstrong. EVA Duration: 0.0188 days. Nation: USA. Related Persons: Aldrin, Armstrong. Program: Apollo. Class: Moon. Type: Manned lunar lander. Flight: Apollo 11. Spacecraft: Apollo LM. Internal Vehicular Activity. Threw excess equipment out of LM before lift-off..
1969 July 21 - . 02:39 GMT - . EVA Apollo 11-1 - . Crew: Aldrin, Armstrong. EVA Duration: 0.10 days. Nation: USA. Related Persons: Aldrin, Armstrong. Program: Apollo. Class: Moon. Type: Manned lunar lander. Flight: Apollo 11. Spacecraft: Apollo LM. 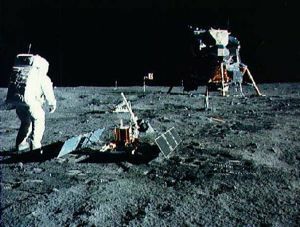 Explored lunar surface near LM and deployed EPISEP unmanned scientific station equipment..
Apollo 11 heads back to earth. - . Nation: USA. Flight: Apollo 11. 1969 July 24 - . Landing of Apollo 11 - . Return Crew: Aldrin, Armstrong, Collins. Nation: USA. Related Persons: Aldrin, Armstrong, Collins. Program: Apollo. Flight: Apollo 11. At 16:50 GMT Apollo 11's command module Columbia splashed down in the mid-Pacific, about 24 kilometers from the recovery ship U.S.S. Hornet . Following decontamination procedures at the point of splashdown, the astronauts were carried by helicopter to the Hornet where they entered a mobile quarantine facility to begin a period of observation under strict quarantine conditions. The CM was recovered and removed to the quarantine facility. Sample containers and film were flown to Houston. Return to earth of Apollo 11 - Kennedy's objective is met. - . Nation: USA. Flight: Apollo 11. 1969 July 27-August 1 - . 1969 July 28 - . Apollo 11 mission anti-souvenier measures - . Nation: USA. Program: Apollo. Flight: Apollo 11. 1969 August 1 - . 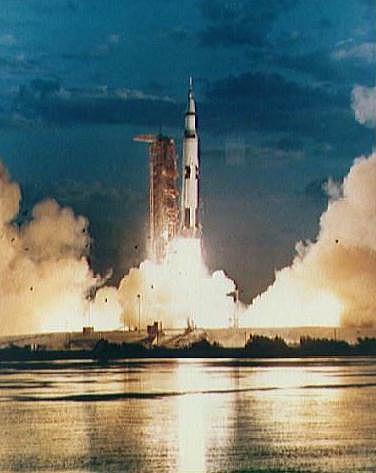 Launch Vehicle: Saturn V.
1969 August 19 - . The Apollo 11 seismic experiment package on the moon was reactivated - . Nation: USA. Program: Apollo. Flight: Apollo 11. The Apollo 11 seismic experiment package on the moon was reactivated. Indications were that the unit was fully functional. The laser reflector was also operating well. Scientists at the McDonald Observatory, Fort Davis, Tex., conducted ranging operations that established the distance between the earth and the moon, to within an accuracy of 4 meters as 373,794.3333 kilometers. 1969 August 20 - . Kamanin returns to work 'after a forty-day vacation'. - . Nation: Russia. Flight: Apollo 11. There are no published diary entries for the key period of the Apollo 11 landing on the moon or the Luna 15 attempted landing on the moon..
1969 September 16 - . First reported weights of Apollo 11 lunar samples said to be inaccurate - . Nation: USA. Program: Apollo. Flight: Apollo 11. The first reported weights of Apollo 11 lunar samples were inaccurate because of a number of variables that could not be eliminated until after quarantine was lifted, MSC told NASA Hq. Because of the concern this inaccuracy had generated, procedures were being developed for future missions to permit more accurate determination of sample weights early in the Lunar Receiving Laboratory processing cycle. 1969 September 23 - . Guinness records for Apollo 8 and Apollo 11 - . Nation: USA. Program: Apollo. Flight: Apollo 11, Apollo 8. 1969 September 25-26 - . Apollo Manned Space Flight Awareness seminar - . Nation: USA. Program: Apollo. Flight: Apollo 11. A Manned Space Flight Awareness seminar was held at MSC. The seminar, attended by some 500 industry and government representatives, emphasized the need for maintaining the dedication and motivation that led to the success of Apollo 11 ..
1969 November 17 - . Changed nomenclature for the lunar exploration phase of the Apollo program - . Nation: USA. Program: Apollo. Flight: Apollo 11. 1970 January 5-8 - . 1970 July 17 - . 1973 November 2 - . Space Window with a two-centimeter Apollo 11 lunar sample commissioned for the National Cathedral - . Nation: USA. Related Persons: Paine. Program: Apollo. Flight: Apollo 11. With the support of the trustees of the Washington Cathedral, Francis B. Sayre and Thomas O. Paine commissioned a large stained glass Space Window to be installed in the south wall of the nave, the main auditorium of the Cathedral. The window would be 5.4 meters high by 2.7 meters wide. The center of the window would contain an Apollo 11 lunar sample 2 centimeters in diameter. 1974 July 13 - . Nixon proclaimed July 16-24 United States Space Week on the fifth anniversary of Apollo 11 - . Nation: USA. Related Persons: Nixon. Program: Apollo. Flight: Apollo 11.